Glamorgan will rest bowlers Michael Hogan and Graham Wagg for Monday's One-Day Cup match away to Middlesex. 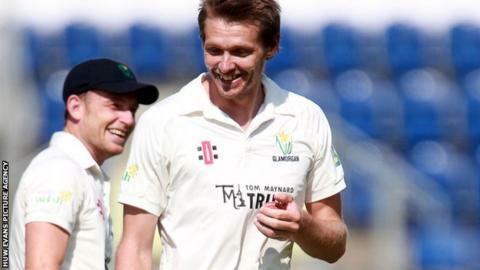 Reaching the quarter-finals is beyond Glamorgan after being docked two points for an "unfit pitch" against Hampshire. Batsman Jeremy Lawlor is set to make his debut, while opener James Kettleborough is set for his first limited-overs appearance for the team. And seamer Dewi Penrhyn-Jones is expected to make his first appearance of the season. "James Kettleborough got a hundred for the second team last week, Jeremy Lawlor got some good scores for the second team, Dewi Penrhyn-Jones will come in and have an opportunity, Ruaidhri Smith will have an opportunity," said Glamorgan coach Toby Radford. "It's an opportunity for these guys to come in and show what they've got and no better place than the home of cricket. But there's still some quality players in there." Off-spinner Kieran Bull could also make his first limited-overs appearance, while there is again no place for regular wicket-keeper Mark Wallace, with Chris Cooke set to take the gloves as he did in the rained-off match against Sussex on 5 August. Wagg is expected to return for the final One-Day Cup game away to Lancashire, but Hogan will be rested again ahead of the Championship game at Old Trafford that follows. Glamorgan squad: JA Rudolph (capt), JM Kettleborough, WD Bragg, CA Ingram, CB Cooke (wkt), DL Lloyd, CAJ Meschede, AG Salter, RAJ Smith, D Penrhyn Jones, KA Bull, JL Lawlor.